Grey's Anatomy begins in the middle of the night. Bailey's young patient who needs transplants is still around. Arizona Robbins isn't happy about being paged in the middle of the night for something that isn't an emergency. Derek is paged because the death row inmate patient, William, is getting worse. His brain contusions are expanding, and if he doesn't have surgery soon, he'll die. Since he's about to be executed by the state in five days, he's thinking that he should refuse surgery and die a natural death. Lexie is now living in Meredith's attic. She has Mark stashed up there for some action, and he wants to sneak out, but all the other denizens of the house are downstairs cleaning in anticipation of Derek's mother coming to visit! The next morning, the death row inmate is still refusing surgery, so Derek's plan is to wait for him to lose consciousness due to his brain contusions. The minute he does, all they need is for two doctors to consent to his surgery for him, and they will patch him up in the OR. Meanwhile, Bailey rips Sadie a new one for giving false hope to Jackson's mother, saying that it shouldn't be too hard to get a liver transplant. Bailey tells her that she is not to say anything at all unless she is called on. Sadie is pissed. Miranda and Meredith wheel their patients out into the hall simultaneously. Jackson tells the prisoner that he needs a liver, and the inmate casually but seemingly seriously offers him his. He asks Meredith to cross-check his blood type with Jackson's. Derek's mother shows up. Rebuffing the car service that Derek ordered for her, she hopped on a bus. Callie's patient this week is a short guy who went to Hong Kong to have his legs lengthened. Callie tells her vertically challenged patient that they have to take out the leg-lengthening device and take out the dead tissue. Bailey yells at Robbins about how best to treat Jackson, and Robbins yells back. Then Alex comes in and says that they've got organs. Robbins and Alex hop on a plane to retrieve the organ, and Robbins chats incessantly, even asking Alex about whether he thinks Izzie is the one for him. He snaps that he doesn't make plans. Meredith and Derek have lunch with his mom at the hospital. She asks her about her family, and Meredith makes a retreat to go treat the killer. Mark runs into D's mom, and he's got guilt all over his face because he's sleeping with Little Grey. Elsewhere, Izzie picks on Cristina about what kind of awkward date she'll have with Major Hunt, which she's planning. Meredith tells the prisoner that he is a transplant match for Jackson. Derek's mom meets Lexie and asks if she is a good girl. She asks her about the number of sexual partners she has had and any speeding tickets. While operating on the the little guy, Callie rehashes her previous personal disasters, and why these are the reasons she is afraid to try for another relationship. On the plane on the way back home after harvesting the organs of a young boy, Robbins inquires what Alex is getting Izzie for Valentine's Day. Alex yells at her, asking her what the hell is wrong with her. They just pulled a liver and an intestine out of a small, dead boy, and all she can do is talk about relationships. Robbins schools him about the ways of coping with a stressful profession. The prisoner starts coding, and Meredith rushes to get him into surgery. He begs her not to so he won't have to die like an animal via execution. Cristina signs a consent form to make him have surgery and Derek yells at Meredith to sign the form as well. She does not, so Derek signs it himself and chooses only Cristina to scrub in with him. Robbins and Bailey do the transplant procedure on Jackson. It looks like everything is going fine, until Sadie notices a spot on his duodenum. It turns out that the organs are already dying. They can keep him alive for 24 hours, but they'll need new organs as soon as possible. Cristina finally makes the first move toward BFF reconciliation by telling Meredith that her ponytail is ridiculous. Aww. Derek's mom tells Mark that Lexie is a lovely girl, and she approves of the relationship. The short man is a quarter of an inch shorter now that Callie had to shave off some of his bones. He freaks out, but his lays into him that he should be less self-absorbed. Der's mom noticed earlier that Major Hunt doesn't like talking about Iraq, so before she leaves the hospital, she asks him how he's sleeping. He says he's sleeping fine, but of course, he's not. The prisoner's surgery goes well. Derek is still angry around him. Der's mom catches up with Meredith, who seems to have given up with the shiny, happy front. She tells her the truth about how the pink and the ponytail and the smiling with teeth are all phony. Back at home, his mom tells Derek he needs someone like Meredith, someone who doesn't see things in black and white, and that she is the woman for him. She gives him her ring for when he proposes to Meredith. Meanwhile, Izzie breaks up with dead Denny because she wants to go out on a date with him and tell her friends about him and not be crazy. Later, Alex suggests to Izzie that night that since they have some vacation coming up. He wants to go on a roadtrip to Iowa so that she can meet his mom. Aww, he's making plans! Izzie is happy and kisses him. Denny sits down next to Alex, saying, "Alex, we need to talk." Alex can't hear him, obviously. Hunt shows up very drunk and very late at Cristina's apartment, and she is very pissed. She tells him to take a shower. He runs into her bathroom and gets under the shower with clothes and shoes still on. He remembers the best surgery he ever performed. He tells her about the time he saved a soldier's life, but a month later, the soldier shot himself. Cristina gets into the shower with him, also fully clothed. At the hospital, Meredith hears about how Jackson's transplant failed. She goes to William and tells him that since Derek had to take out a piece of his skull, the only thing covering his brain right now is dura. He must be very careful not to hit his head; otherwise, his brain will swell so much that he will become brain dead. She says this in such a way that by reading between the lines he gets the message of how he can die and donate his organs to Jackson. As soon as Meredith leaves, he starts ramming his head against the headboard. Fade to black. What did you think? 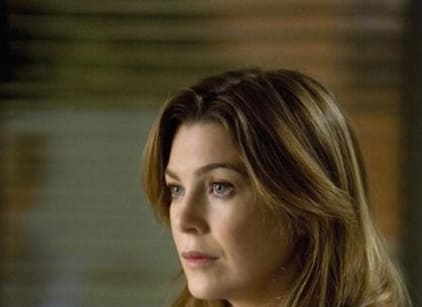 Discuss in our Grey's Anatomy forum! We're human. We make mistakes. We misestimate. We call it wrong. But when a surgeon makes a bad judgment call, it's not as simple. People get hurt. They bleed. So we struggle over every stitch. We agonize over every suture because the snap judgments, the ones that comes to us quickly and easily without hesitation, they're the one that haunts us forever. My mother used to say this about residency, "It takes a year to learn how to cut. It takes a lifetime to learn not to." Of all of the tools on the surgical tray, sound judgment is the trickiest one to master. And without it, we're all just toddlers running around with ten blades. What A Pity Right Away, Great Captain!